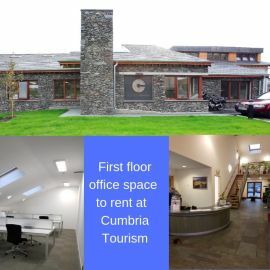 Looking for office space in Cumbria? Make the most of this rare opportunity of a professional space in Staveley, a central and convenient location with easy access to M6 and major Cumbrian routes. Availability includes private office space for up to 10. For further information please contact info@cumbriatourism.org or call Reception on 01539 822 222.